Our custom banners can be made for interior or exterior use for your exhibit or display back drops, display tables or for advertising your party, grand opening, church or organizational, or sporting events. Indoor Banners - Indoor Banners can be made from a lightweight 10 oz vinyl or from a woven nylon material that has the rich look of fabric. The banners are hemmed and can come with grommets or D-rings for easy hanging. Outdoor Banners - Our strong durable outdoor banners are made from a heavier vinyl−from 13oz to 20oz, depending on the application. These banners are strong and sewn with an improved D-ring construction method. They have proven dependability thousands of times in installations over streets, on construction sites, etc. Dye Sublimation - We also offer dye sublimation printing on textiles for your full color graphics. "Attention Getting", "Rich, "Wrinkle Resistant", and "Washable" are all words that describe this increasingly popular product! 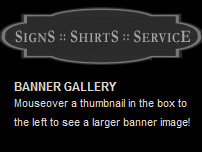 Uses for this process include banners, wall hangings, trade show displays, and especially table covers. Generate excitement. Attract and motivate customer. Whether you choose a simple one-color banner, a multi-color banner with your logo, custom artwork or clipart, or a full-color digitally printed banner, all banners are an economical way of drawing attention and delivering your message.